For women with frizzy hair, it can be extremely tough to find the right straightener. Frizzy hair can be thin or thick, too. For thick, frizzy hair, you have a double curse. 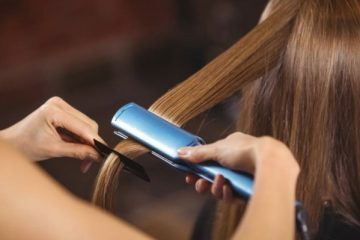 You’ll want a straightener that can get to a pretty high temperature. It can’t damage the hair, though. That’s always a concern with high temperatures. 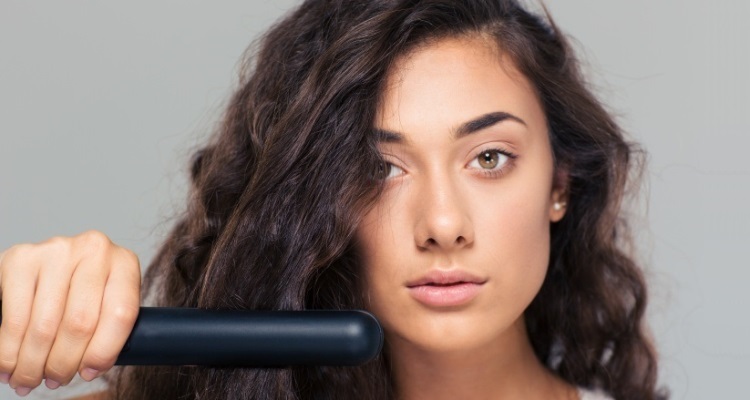 The best flat iron for frizzy hair will put moisture into your hair. It’ll make your hair shiny and silky. It won’t snag or pull while straightening. That can be a lot to ask from one straightener. Choosing the right straightener can be a challenge. 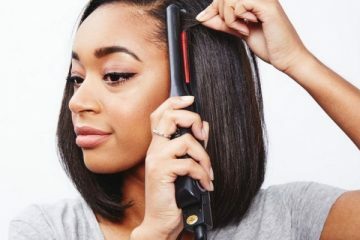 These are 5 of the best flat irons for your hair challenges. The HSI is a flat iron that professionals and home users alike will be able to use. It straightens hair quickly with only the heat that’s needed. The HSI flat iron won’t singe your hair. It’s a slim design with plates measuring 1 inch. It’s easy to handle and the right size for most every user. Flat irons should have a way to adjust the temperature. Especially if it’s going to be used in a salon. 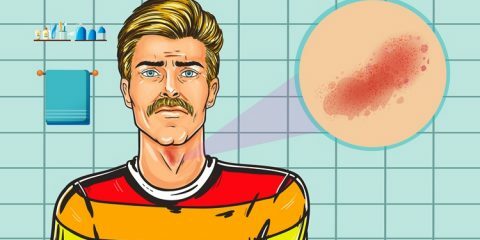 Those with thin hair don’t need the same high heat as women with curly, thick hair. 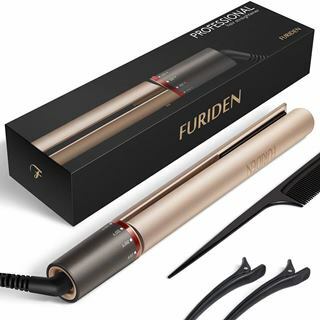 This adjustable flat iron can go from 140 degrees Fahrenheit to 450 degrees F. It reduces the risk of damaging your hair while straightening. Especially when you’re trying to tame frizzy hair. The cord will swivel 360 degrees and it’s extra long for ease of styling. The flat iron is 110/220 voltage. The dual voltage makes this a great travel beauty device, too. You don’t have to sacrifice your style when you’re traveling to other countries. The plates are made of ceramic, but they’re mixed with tourmaline. Ceramic plates are good for women with thin to medium weight hair. The tourmaline also distributes heat more evenly for women who need more heat for styling. Negative ions are a good way to add moisture to hair that tends to frizz. Tourmaline is a good source of those ions. 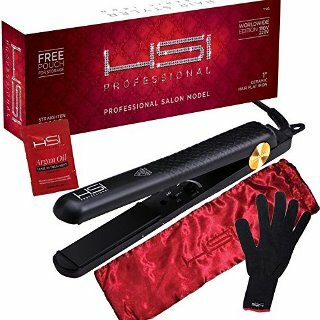 The best part of this HSI flat iron is the way it caters to all types of hair texture and weight. From thin to thick hair, the temperature is adjustable. It has a wide range of heat options, too. From 140 degrees F to 450 degrees. That’s a range where everyone can get the right amount of heat for their particular hair needs. This flat iron has a thoughtful design that takes into account a woman’s on-the-go lifestyle. It’s dual voltage, so it’ll work with 110 or 220 voltage. It doesn’t take a complicated adjustment or extra attachments to be used anywhere. It comes with accessories that are very useful, too. There’s a heat glove, so you don’t have to worry about burning your fingers. It comes with a travel-size Argan oil treatment. It’s meant to smooth and protect your hair. That reduces flyaways, frizz, and heat damage. There’s a silk carrying case for traveling with the flat iron as well as all the accessories. The temperature control is inside the straightener. It can be difficult to reach if you want to change the temp while using it. This flat iron has a 1-inch titanium plate that can be used for any hair type. It’s focus, though, is on thick frizzy hair. The best flat iron for thick frizzy hair is one that can get up to a high temperature. This one has extreme heat settings up to 450 degrees Fahrenheit. There are 50 heat settings so you can dial in the perfect amount of heat. The titanium material of this straightener resists corrosion. It’s important for a device that will come into contact with your hair and styling products. Styling products will keep the heat from damaging your hair, but also, make it shinier and silky. Those products will be left behind on the plates. They won’t become rotted or damaged by the products, either. Although it’s 1 inch in width, the plates are 5 inches in length. That allows for thicker sections of hair. When your hair is thick, you want to be able to do wider sections. It’ll make the process go much faster. The outside of the device often conducts heat. It’s why some flat irons come with a heat glove. It’ll keep you from burning your fingers. At 450 degrees, that can lead to serious burns. The Ryton casing is cool to the touch, so it’s safe to touch the device. It won’t cause burns if you accidentally touch the casing. My favorite part of this device is the slim design. Sometimes, flat irons are too thick and bulky. It can be hard to hold them for a long period of time. It can take some hand strength to squeeze hair through the straightener. It’s easier to squeeze a thin straightener versus one that’s thick. The length of this flat iron means that you can take wider sections of hair. With wider sections, you’ll finish your hair quickly. You’ll need less swipes of the flat iron, too. Thick hair can be hard to straighten because the sections are so thick and wide. Not a problem with this device. 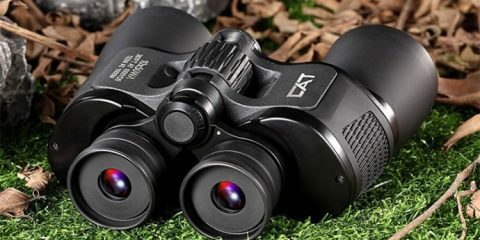 The high heat and titanium plates conduct heat evenly. This makes the process quicker and the hair will be shiny and silky after you’re finished. The design is easy to handle and the plates are professional-quality strength and heat. This won’t close tight enough for thin hair. It’s exclusively for thick, frizzy hair. This ceramic flat iron plates measure 1 inch. That’s a pretty standard size for most flat irons. The ceramic is infused with materials that make use of negative ions and infrared heat. The plates allow hair to slide through without tugging or snagging inside. It’s a pretty smooth process. The negative ions work to keep hair from becoming frizzy. They add moisture as well as shine into the hair. The straightening iron heats up very quickly. It has a flash heating element that will bring it up to 392 degrees fast. That’s the only temperature you’re going to get with this straightener. It’s as high as some of the other models without you having to experiment. It’s the right temp for thick, frizzy hair. As a hair styling device, this does more than straighten. The iron is styled for straightening your hair or adding curls, flips, or waves into your hair. The edge of the device is rounded for ease of use. The swivel cord is 11 feet long. That’s long enough for you to never have to worry about being snagged by the cord as you work. 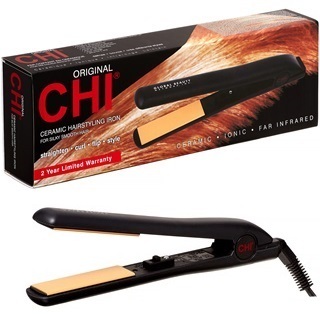 CHI is an extremely popular company for providing straighteners. Most everyone has heard of them. They provide professionals with devices to be used day after day in salons. The company gives you a 2-year warranty that really shows they back their product. This is a good hair styling device that can be used anywhere. It’s great for travel since it’s dual voltage. You will need an adapter to utilize the dual nature of the voltage, though. The hair styling device is truly versatile. You won’t need three devices to perform different styles in your hair. To start, you can straighten your hair. After that, you can easily add curls, waves, or flips into your style. When you start with sleek, shiny hair, you can easily add volume with curls or waves. It’s unfortunate that it doesn’t have an adjustable temperature control. This is a titanium flat iron with a ceramic heater. Between those two elements, you’re getting sleek hair with moisture. It won’t break your hair, dry it, or damage it. The titanium plates are 3D floating plates. They won’t pull or snag on your hair while straightening. The flat iron has 1-inch plates. The slim plates make it simple to do all kinds of styling with this flat iron. Curls and waves are easy styling that can be achieved with this straightener. Since it performs more than one function, you won’t have to buy other devices. For temperature concerns, this one has a variety of heat settings. It starts at 270 degrees F and continues up to 450 degrees F. They recommend that thin, fragile hair uses the 270 to 320 degrees for styling. Damaged hair should use the range between 330 degrees and 380 degrees. For thick, healthy hair, the range between 390 and 450 degrees is perfect. The LCD display will help you choose the right temperature. There are a few extra features like safety shutoff that should be appreciated. The auto shutoff will turn the device off after 90 minutes. You’ll never come home and be shocked to find that you’ve left the flat iron on. Also, it’ll heat up to 380 degrees F in 15 seconds for quick straightening touchups. One of the best things about this product is the safety feature of auto shutoff. Every woman has left their curling iron or flat iron plugged in while running out the door. It’s a huge safety concern since it’s a fire hazard. It could also give someone serious burns if they touch it. The LCD will display the temperature in statements about your hair. For example, it will say FRAGILE for temperatures between 170 and 320 degrees F. It’ll say DAMAGED or HEALTHY for higher temperatures. You don’t have to remember the perfect heat for your hair. It’s easy to see where you should have the heat for your hair type. The flat iron has dual voltage of 100V to 240V, so it can be used worldwide. That’s fantastic if you travel abroad for any reason. Your vacation style can be just as beautiful as your nighttime style at home. All you need is an adapter for the socket when you’re traveling. It comes with a velvet storage bag for travel, too. The outer casing can be incredibly hot to the touch. You’ll need to purchase gloves separately. This is a ceramic straightener with the ability to straighten and curl your hair. It has a unique style that’s rounder than a traditional flat iron. It’s a one-step straightener and curler with rounded barrels. The floating plates inside are flat, but the outer case is rounded for curling. The straightener heats very quickly with MTC. It’s a new heater used by this company. The entire heating process is quicker than others. It only takes 15 seconds for the straightener to get to the right heat setting that you’ve dialed in from the outside. With the twist of the dial, you can get temperatures from 250 degrees F to 450 degrees F.
This is a dual voltage device (110-240V). You don’t need an adapter for it, either. It will automatically adjust itself to fit the voltage worldwide. There’s also a safety lock for travel with this straightener. The cord of this straightener is incredibly long, too. That’s a good feature whether you’re home or traveling. It’s 97 inches long. You could plug it in anywhere and have the freedom to move the device where you need it. My favorite part of this product is hard to choose. There are two pretty great features. The amount of time it takes most straighteners to heat up is huge. With a normal straightener, you would have to shower and do all kinds of prep while waiting. With this one, it only takes 15 seconds to get to the proper temperature. Another great feature is the ability to straighten and curl. Most flat irons have a slight curve to the edge of the plates. That will help you make a slight curl. You have to really manipulate the flat iron to get a good curl. This one is designed to make curling easier. The floating plates won’t snag or pull your hair. That’s always a huge concern with straighteners. You don’t want to be uncomfortable while pulling the device through your hair. The device comes with accessories like hair clips for sectioning hair properly, too. The plate length is only a few inches. You’ll need to use small sections of hair when straightening. Flat irons come in a few different materials. There’s the ceramic straightening iron, which has plates made of ceramic. They glide smoothly with even heat over most hair types. Titanium irons heat very quickly and distribute that heat evenly over the entire plate. They’re good for curly hair or coarse hair. Lastly, there’s tourmaline. 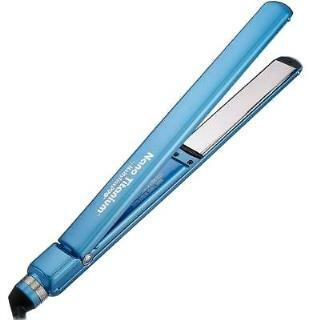 These are also called ionic straighteners. They help reduce frizz. The type of hair you have will influence the type of flat iron you purchase. Ceramic devices are good for thin or medium hair. The hair is smoothed through the flat iron without snagging. The titanium iron can be used for coarse hair while the tourmaline iron is good for hair that’s been damaged. Frizzy hair will react well to the tourmaline iron. 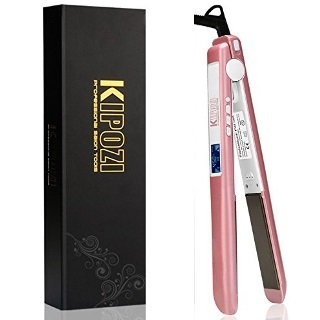 It introduces negative ions that can straighten hair without adding as much heat. Damaged, frizzy hair will benefit from ions. You would think that the higher the temperature the better the iron. In fact, it’s all about finding the right temperature for your hair. High heat is great, but could damage your hair if the texture is too fine. An iron with adjustable heat is a good compromise. You’ll get high heat when you need it. It should be able to go high or low depending on the type of straightening you need, too. It’s vital that the heat is distributed evenly. A flat iron’s plate is flat of course. The edges can be sharp or rounded. The rounded edge can be used to style your hair as well as straighten. The sharp-edged iron will give you hair that’s straighter. The width of the plate will influence how fast your hair is straightened. Women with fine hair might find that wide plates distribute too much heat to the hair shaft. That can be damaging. Narrower plates will be better for fine hair. Women with coarse hair will want wide plates. This is an important safety feature. You don’t want to leave the iron on all day. When you’re on the run, it’s easy to forget to shut down the iron. You won’t have to worry about that with an automatic shut-off. The iron will shut down after a certain amount of time. It’ll save on energy and won’t start a fire. Those are vital considerations for safety. The first step to straightening actually begins long before you start up the flat iron. First, you’ll want to use the right kind of shampoo and conditioner. If you are prone to frizz, use a conditioner that will smooth or prevent it. It will usually say smoothing on the label somewhere. Dry hair will often look very frizzy. You’ll need to make sure your hair is very nourished. It should be free of product buildup, too. A build up of products can cause frizz. Once you’re out of the shower, it’s time to dry your hair. Don’t use a nylon or plastic brush on your hair. Boar bristle brushes will tone down the frizz while plastic will cause it. If you blow dry your hair, blow the hair downward to avoid it frizzing up. Applying a heat protectant is important, too. Never straighten your hair when it’s wet. Turn the iron on to the right temperature for your type of hair. If you have fine hair, the temperature should be around 300 to 350 degrees. With coarse or curly hair, the temperature should be much higher. As you experiment, you’ll find the temp that works best for your hair. Whether you have chosen a ceramic plate or tourmaline, it’s time to begin straightening. Use a styling brush to brush through your hair. Pull the hair into sections. You don’t want to randomly start digging in with the iron. You want to apply as little heat as possible to obtain your desired look. Take small one-inch sections and pull it taut. Place the iron’s plates around the hair starting at the scalp. You want to be as close to your head as possible. Slowly pull the iron down the sectioned hair to the end. It’s best to do it in one slow-moving motion. Try not to stop on any section for more than a second. You don’t want to fry your hair. Hair that’s been damaged can look very frizzy. Continue until all your hair has been straightened. After you’re done, apply a bit of hair spray to your brush if you plan on brushing through your hair. It’ll stop the frizzies. The best flat iron for frizzy hair will add shine and make your hair silky. The hair you get out of the straightener has to be better. The straightener can’t cause damage or leave hair dry and brittle. You already have enough challenges with dry, frizzy hair. You need the right straightener for your hair type. It should have a range of temperatures to make your hair shiny and beautiful. There are some incredible choices here. You will be satisfied with any of them, but choose the one that has the features you need in your styler.